If you’ve never been Sacramento your view of the city will forever be changed by Lady Bird and the charged relationship between Saoirse Ronan and her mother (Laurie Metcalf). You may find yourself looking for the street where the title character throws herself out of a car. It may be unfair but isn’t that the kind of association Fellini lent to Rome in La Dolce Vita. Anyway you’re more likely to get to Rome than Sacramento, which though the state capital is less a destination than say Los Angeles or San Francisco. Then again if you’re going to Yosemite the setting for another recent movie which may have left it’s imprint on your imagination (Free Solo) you may very well find yourself flying into Sacramento—a city that might otherwise elude preconception, having no Golden Gate or Sunset Boulevard to speak of. If Greta Gerwig hadn’t been born in Sacramento and the movie didn’t have an autobiographical element, this lack of facile distinction in the minds of many viewers might have been a reason why the director might have scouted it out, as a location for her movie. After all, the way it’s painted is as a launching point, a place to escape from for a person who wants to become a great actress. Of course the other element is the Catholicism. There are no bell towers like the one overlooking the Mission San Juan Bautista in Vertigo, but religion plays a part of the story. How infused in Catholicism is Sacramento? 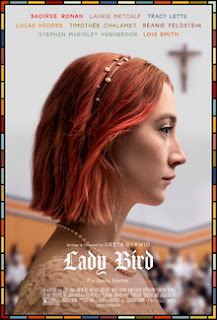 Lady Bird eventually ends up visiting a Presbyterian church when she gets to New York, but as for Sacramento, you've got to visit to fill in the dots.